"There's really no reason in this country today that people can't maintain their own teeth for their entire life," says Kimberly Harms, D.D.S., a dentist in Farmington, Minnesota. Public health activities, such as fluoride in tap drinking water and consumer education on proper dental hygiene, have helped bring about a decline in cavities in the past 50 years. Today, half of all American children under age 12 have never had a cavity. For adults, these preventive measures, along with new filling materials, are enabling many of them to keep their own teeth for the rest of their lives. Kids today have it so good; computers in the classroom, Nickelodeon on cable TV, popcorn in the microwave. They also have it good because they rarely get dental cavities. And, for those who do develop tooth decay, newer dental devices the FDA has cleared in the past several years are less painful than the traditional dentist's drill of old. The only way to treat tooth decay, technically known as dental caries, is by cutting away the decaying portion of the tooth, a procedure that is done almost 200 million times a year. Until about 5-years ago, the only way to do that was with the standard hand piece, commonly known as the dental drill, a device that dates to the 1700s. Modern high-speed hand pieces revolutionized dentistry when they were introduced over 40-years ago. Today, dentists have two other options -- the erbium:YAG laser and the micro air abrasion unit. FDA cleared the erbium:YAG laser for marketing for use on adults in May 1997 and for use on children in October 1998. Though the clearances were the first of their kind for treating "hard-tissue" in the mouth, the laser actually was introduced into dentistry in 1995, when FDA cleared a laser device for gum surgery. As of March 1999, two companies market the laser for dental decay: Premier Laser Systems Inc., of Irvine, CA. and BioLase, of San Clemente, CA. The erbium:YAG laser essentially vaporizes decayed tooth tissue. A stream of laser light that passes through a fiber connected to a pencil-like hand piece is directed to the decayed area. The laser hand piece looks like the standard hand piece and, like the standard hand piece, must be used in a controlled manner so that it doesn't slip and damage healthy tissue. "The laser is a cutting instrument," says Susan Runner, D.D.S., branch chief of dental devices in FDA's Center for Devices and Radiological Health. "And like any cutting instrument, dentists have to be careful any time they use it. The laser has many of the same risks as the drill." Another similarity between the dental drill and the laser is that both use water and air to cool the tooth and clean the surface during removal of decay. While dentists and patients may wear eye protection during conventional treatment to protect against the spray of water and particles, they must wear goggles during the laser procedure to protect their eyes from straying laser light. The laser has several benefits over the hand piece: Because laser treatment is usually painless, there is no need for anesthesia -- or anesthetic injections -- in many patients, and dentists do not have to wait until their patients' mouths are numb to begin treatment. Also, the laser eliminates the vibrating sensations of the high-speed hand piece. Also, compared with the standard hand piece, the laser can work with better precision, saving more of the healthy tooth. And when the laser procedure is done, patients do not have to wait for the numbness and puffiness related to the use of anesthesia to fade. For many patients, especially those particularly fearful of the dental drill, the laser has drawn rave reviews. "My patients love it," says Edward Romano, a dentist in Morris town NJ. who has used the laser since 1997. They say, "I can't believe it's so comfortable, that dentistry has come this far." However, the dentist's and doctor's laser may be a perfect laser in some important ways but is not without its own limitations. For one, it can't be used on teeth with fillings already in place. According to Runner, there is the risk of damage to the tooth because the filling heats up. Romano says silver fillings also damage the laser tip. Also, studies show that the laser procedure takes longer than the conventional method. "The laser is really ideal for virgin teeth -- for new decay," Runner says. "Dental lasers is a growing field, but they can't do everything. There's still a need for the standard hand piece." Another potential pitfall is expense. Recently, Premier Laser Systems was citing a list price of about $45,000 for its Centauri laser. That includes training for the dentist. The standard high-speed hand-piece typically sells for around $600. Premier Laser estimates, however, that while the typical laser procedure costs about $13 more on average than the same drill procedure, the cost reductions of not using anesthesia and having more time to spend with other patients could actually save dentists about $70,000 over 3-years. Still, some dentists say they are putting off buying a laser for treating cavities, at least for the near future. "Our position [in my dental practice] is that the laser looks promising," Harms says. "But we're not using it yet. We're waiting for long-term studies and newer tools." The other alternative to the traditional high-speed hand piece is the air abrasion hand piece. Air abrasion involves the use of a high-pressured instrument similar to a tiny sandblaster. A stream of tiny aluminum oxide particles cuts away the decay. There is no heat and no vibration, and often, it can be used without anesthesia. It also can be used to remove some fillings, although it is not yet cleared for removing amalgams (silver-colored fillings). Harms, who uses air abrasion, says the technique is ideal for small cavities and fillings in children, but she notes, "It doesn't replace the drill." Once decay is removed, a filling is placed inside the cut-out area to retain the tooth's shape and function, including chewing. Today, a variety of filling materials is available. One of the oldest and now most commonly used is amalgam, a metal alloy of silver, tin, copper, and sometimes indium, palladium and zinc that is mixed with about an equal amount of mercury. FDA regulates amalgam alloy as a medical device. According to an article in the Journal of the American Dental Association, dentists continue to use amalgam primarily because it is inexpensive and durable and withstands the tremendous forces of chewing. An old Public Health Service report on dental amalgam said that amalgam typically lasts from 8 to 12 years. Only gold alloy and metal-ceramic crowns last longer, up to 18-years. Amalgam has drawn controversy in the past 10 years because its critics contend that the mercury emits minute amounts of vapor, causing a variety of health problems ranging from multiple sclerosis and arthritis to mental disorders. However, several investigations by the federal government and others have not borne this out, and the use of amalgam is supported by FDA, the National Institute on Dental and Craniofacial Research, the American Dental Association, and other professional organizations. In a scientific literature review published in the November 1998 Journal of the American Dental Association, professors of dentistry in the United States and China found that research has not yet shown that mercury vapors escaping amalgams are "in concentrations high enough to produce any detectable effect on the body." The authors concluded that, contrary to some dentists' current practice, "dentists cannot ethically tell patients that amalgam is a health hazard and that removal of restorations will benefit their health." While amalgam remains the most commonly used dental filling, its use does appear to be declining. According to the dental association's journal article, the use of amalgam for filling back teeth has dropped from 85 percent in 1988 to 58 percent in 1997. "The use of amalgam will likely continue to diminish, and it will eventually disappear from the scene," the journal article said. One reason for the decline is the introduction of new materials that afford similar durability and strength as amalgam and, unlike the silver-colored fillings, can be made to match the color of a patient's teeth. "The aesthetics' side of it is very important to many patients," Runner says. However, using these materials -- composites, glass ionomers, and metal-ceramic crowns -- can cost a patient from 1.5 times to 8 times the cost of an amalgam restoration. Of course, much of the pain and expense of treating cavities can be eliminated through preventive measures. Many of these measures, says Dennis Mangan, Ph.D., chief of the Infectious Diseases Branch of the extramural division of the National Institute on Dental and Craniofacial Research, are aimed at interrupting the decay process -- for example, eliminating the sugars that serve as a source of food for bacteria in the mouth, eliminating the bacteria that feed on the sugars, strengthening the tooth's enamel to make it harder for acids to attack. Or, Mangan says, "It can be some combination of all of them." Some of the most successful preventive measures involve fluoride, a mineral that occurs naturally in many foods and water. Fluoride helps prevent decay by making the tooth more resistant to acid attacks. It also has been found to reverse early decay where acid has broken through the enamel by re mineralizing the affected area. To function effectively as an anti-decay substance, fluoride should not only be applied to the teeth but ingested, as well. The most important way in which fluoride is ingested is through fluoridated public drinking water. Dental experts cite water fluoridation, which began 50 years ago, as the main reason for the decline in cavities in children since World War II. In areas with inadequate or no water fluoridation, children between 6 months and 16 years may need fluoride supplements. A dentist can prescribe the correct dose. Fluoride can be applied directly to teeth with the use of fluoridated toothpastes and mouth rinses. Less-concentrated rinses are available over-the-counter, while stronger concentrations require a dentist's prescription. Consumers need to be sure that children don't use fluoride products without supervision because excess ingestion of fluoride can cause defects in the tooth's enamel that range from barely noticeable white specks or streaks to cosmetically objectionable brown discoloration. The defects, known as fluorosis, occur while the teeth are forming, usually in children under 6 years. Although tooth staining from fluorosis cannot be removed with normal hygiene, a dentist may be able to lighten or remove these stains with professional-strength abrasives or bleaches. Although excess fluoride intake can be toxic, most reported adverse reactions involve vomiting, diarrhea and eye irritation. Because fluoride is a drug, FDA requires toothpaste manufacturers to include on the labels of fluoride toothpastes a warning that the products should be kept out of the reach of children under 6. In addition, because FDA requires all over-the-counter oral drugs to bear an accidental-ingestion warning, toothpaste labels also must carry a warning that instructs consumers to contact a professional or a Poison Control Center if more than the normal amount used for brushing is swallowed. This labeling requirement took effect April 1997. Another highly effective way to prevent cavities is dental sealants. Plastic material that's usually applied to the chewing surfaces of the permanent back teeth, sealants bond into the depressions and grooves of the chewing surfaces, acting as a barrier to plaque and acid. According to the American Dental Association (ADA), sealants are "virtually 100-percent effective at preventing tooth decay." They can be used on the permanent teeth of both children and adults. Though sealants are considered to be most beneficial to children, a 1990's study published in American Dental Association ADA journal found only 20 percent of school-aged children have dental sealants on their permanent molars. Cost-wise, sealants average about half the cost of a filling, according to the American Academy of Pediatric Dentistry. Another reason for the decline in dental caries can be attributed to public education aimed at encouraging consumers to follow good oral health practices at home and see a dentist regularly, beginning as early as age 1. "Most patients now know [they should] see a dentist regularly," says Cleveland dentist Matthew Mecini, D.D.S., citing statistics that show that 50 percent of adults actually follow that advice. "We [the dental community] are doing a better job of educating the public on the need for regular dental care." combined with ongoing health, wellness and disease prevention for all ages. Efforts to reduce cavities don't end there. One of the most promising preventives on the horizon is a vaccine-like product against decay. In April 1998, British scientists reported that they had developed a plant-based treatment, which, when applied to the teeth, effectively prevented Streptococcus bacteria, the main bacteria involved in tooth decay in humans, from growing in the mouth for up to four months. In the United States, researchers funded by the National Institute of Dental and Craniofacial Research are studying a similar preventive, known as "plantibodies." Using genetic engineering techniques, scientists transfer a gene for antibodies specific for streptococci to the tobacco plant, which produces large quantities of these antibodies. Antibodies purified from the tobacco plant are then applied to the teeth with a goal of preventing streptococci from adhering to the teeth. "The concept is good," Mangan says, but notes that the high cost of genetic engineering and the bother of applying the substance on a routine schedule may make the product somewhat impractical. Other research, he says, focuses on a vaccine that boosts children's immune systems to prevent decay. The intent of this experimental product is to stimulate the body's own production of antibodies to prevent streptococci from adhering to the teeth. While these experimental products promise an even brighter dental outlook for future generations, kids today can look forward to a life of dental care that even their parents never envisioned. "If you can reduce the anxiety that often accompanies dental treatment," FDA's Runner says, "that's a very positive step, especially for children. That's where a lot of these devices have the most potential -- in children." by Paula Kurtzweil is a member of FDA's public affairs staff. For most people, the first sign of a cavity is pain, but the actual start of tooth decay begins much earlier, with the accumulation of minute amounts of a sticky film, called plaque, on the tooth's surface. Plaque contains bacteria, which feed on carbohydrates in the mouth. As a result of their feeding frenzy, the bacteria produce acids, which can attack the tooth enamel -- the outermost layer of the tooth. If the plaque isn't removed, it continues to build, creating more acid that continues to damage the tooth enamel. There usually is no pain until the acids eat through to the tooth's underlying dentin and pulp layers, where the nerves are located. This decay, technically known as dental caries, is the point at which treatment is needed to prevent further tooth damage and loss. on the root surfaces of people whose gums have receded. Dental decay usually occurs in the back teeth, where it is more difficult to remove food debris and plaque. There are two notable exceptions: early childhood decay in bottle-fed babies and root decay in older adults. Baby-bottle decay usually occurs in the upper front teeth as a result of continuous feeding on sweet liquids, including milk, formula and fruit juice. Nighttime use of a bottle is the most dangerous because the sugars sit on the baby's teeth for an extended time. Tooth loss can result, causing spacing and development problems when the permanent teeth erupt. "It's very nasty," says Cleveland dentist Matthew Mecini, D.D.S. "You don't see it too often, but when you do, it's severe. The amount of damage that can be done to children's teeth in a short time is amazing." Root decay occurs on the exposed root surfaces of older adults whose gums have receded as a result of gum disease. Many types of medicines older people typically use decrease saliva production, which can aggravate the problem. Saliva is important in preventing tooth decay because it can wash away food particles and bacteria and help neutralize acids formed by bacteria in the mouth. The first sign of a cavity forming may be a white spot that in time may turn brown. Most patients, however, remain unaware of the decay until it is well advanced. Common signs that people notice include sensitivity of the tooth when exposed to hot or cold and brief pain after eating a sugar-containing food. The dentist can diagnose decay with x-rays or by probing the tooth with a sharp instrument. Decayed enamel or dentin will feel soft. See your dentist regularly. How often will depend on your particular needs. Your dentist can advise you. Brush your teeth regularly to reduce plaque buildup. 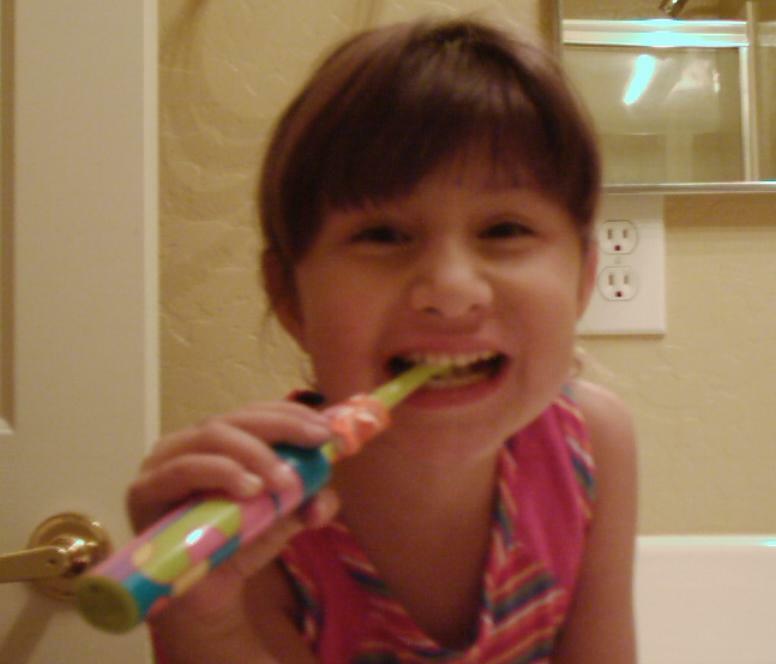 Brushing should last for about 2 to 3 minutes each time to make sure you're reaching all teeth surfaces. Even though there are many kinds of toothbrushes on the market, including electric and sonic models, any will do, says Susan Runner, D.D.S., chief of FDA's dental devices branch. "The most important thing about the brush is to use it and to have appropriate instruction from your dentist or hygienist on how to use it," she says. The American Dental Association recommends switching to a new brush every three to four months. Use a fluoride-containing toothpaste. Check to make sure there is fluoride in the product, says Fred Hyman, D.D.S., a dental officer in FDA's Center for Drug Evaluation and Research, because not all toothpastes contain it. Three kinds of fluoride ingredients are allowed, based on their effectiveness and safety, according to FDA's final monograph on over-the-counter anti caries drug products, which took effect in the 1990s. They are sodium fluoride, sodium mono-fluorophosphate, and stannous fluoride. Toothpaste manufacturers sometimes combine fluoride with other ingredients that are said to reduce plaque and gingivitis (inflammation of the gums). Although FDA has approved one such product, Colgate's Total toothpaste, for helping to prevent cavities, plaque and gingivitis, FDA has not determined the effectiveness of many of the anti plaque and anti gingivitis ingredients. Also, consumers should be wary of claims that a dental product can do more than simply reduce tooth decay because , based on current scientific knowledge, this is the only cavity-fighting labeling claim FDA allows. Floss daily. Like toothbrushes, any kind will do, as long as you use it daily. Flossing helps reduce plaque buildup in areas the toothbrush can't get to. Eat a variety of foods, but eat fewer foods containing sugars and starches between meals, according to the federal government's Dietary Guidelines for Americans. The guidelines say that the more often you eat foods with sugars and starches and the longer these foods stay in your mouth before you brush your teeth, the greater the risk for tooth decay. Consider sugarless candy and sugar free gums made with certain sugar alcohols because they may not promote tooth decay. FDA allows these kinds of foods to carry a health claim to this effect, if the foods meet certain criteria. Click-Here to read "Staking a Claim to Good Health", an FDA Consumer Report. Cavities in children, illustration of dental cavities, children's cavities, electric toothbrush for children, dental cavities in children, pediatric dentistry, tooth brushing technique to preventive dental care, what are some preventives from cavities, pediatric dental caries, children tooth staining, pediatric teeth cavity, pediatric tooth brown, pediatric gum disorders, children's dental procedure, children's laser tooth care, treating cavities, laser dental filling, how many children see pediatric dentists, children and dental fillings, silver tooth crowns children, pediatric tooth drill, dental filling for children, dental cavities and light, kids dental hygiene, children's sugar candy, removing kids sealants, pediatric dietary requirements, pediatric tooth decay, retainers, risks of anesthesia for kids dental surgery, best toothpaste, accidental removal of childrens teeth, standard cost for dental fillings, laser treatment, dental children cutting teeth, signs of cavities in children between front teeth, should children under 5 have dental fillings, childrens toothpaste, pediatric dentistry location, toothpaste dispenser, pediatric cavities, treating pediatric gingivitis, pediatric amalgam 2 surface filling cost, fillings in children, mercury fillings for cavities in children, kids dentist, tooth nerves-children, filling materials used in pediatric patients, the tools that the dentist uses to show the children, pediatric dental cavities, pediatric dental fillings, what kind of anesthetic to use for children, dental fillings children, dental plaque in children, children's childrens medical doctor, types of pediatric crowns, pediatric tooth enamel decay, dental fillings in children under 6, uses of erbium yag laser, laser in dentistry, treating cavities in children, children with decaying teeth, kids dentistry. and more from another month....painless pediatric dentistry, pediatricdentistry, cavities in children, dental staining children, cavities children, alternative pediatric dentistry dental decay, www.pediatricdentistry, oediatricdentistry.org, site PediatricDentistry.org, treating cavities in children, dental sealants, dental sand timer, academy of pediatric dentistry, fillings in children how long?, educating children about good dental care, is diarrhea common when children are cutting teeth, dental hygiene-proper foods to eat, dentistry new dental filling materials for children, filling cavities children, childrens fillings dentist, dental instrument use for children, laser for teeth fillings in children, laser cavity removal, filling childrens cavities, laser surgery, www.PediatricDentistry.org, children tooth models, yag laser dental, about pediatric dental sealants, dental caries vaccine, conventional handpieces dentistry, dental devices, sharp teeth dental hazard, pediatric tooth defects, children and accidental tooth loss, childrens cavity prevention, dental health for kids, pediatric tooth, dietary sugar alcohols and dental caries cavities, pediatriccavities, childrens tooth extractions, childrens tooth damage, childrensdental, children/pediatric dentists, americans dentist, genetic tooth decay, childrens tooth fillings, cnn health, dental hygiene caries pediatric, childrens teeth cavities, new dental techniques in treating caries in children, dental procedure for children to help prevent cavities, pediatricdentist, childrens cavities, kids teeth and childrens dental health!